Orange coloured vinyl. 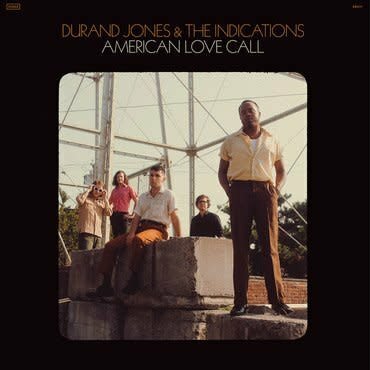 Durand Jones and The Indications return with American Love Call, a fierce album which reckons with how to balance love and fury of modern day America via Dead Oceans/ Colemine Records. It's an album of old-school soul with a new-school honesty. The Indications conjure the dynamism of Jackie Wilson, Curtis Mayfield, and The Impressions. This young band of twenty-somethings are students of soul. American Love Call is an album made the way the Indications dreamed it’d sound, a sprawling and limitless equation; grand and cinematic, yet focused on fleeting details. Recorded at Brooklyn’s Studio G in summer 2018, American Love Call is an expansion of the band’s sound, making a leap forward in both style and songwriting. Pulling influence from a variety of sounds like R&B, gospel, early folk rock, and classical music, the Indications’ second effort has a newfound confidence, with Jones’ bellowing voice and Frazer’s soothing falsetto filled out by backing vocals and instrumentation. Thematically, the album covers tough ground, like the danger of simplifying and romanticizing the past, but it also attempts to reconcile, searching for unifying commonalities. Brooding, bold, and pensive, American Love Call is the result of the band fleshing out its crab and elevating its dreamy, old-soul sound.